Below I will describe how to use our custom type. Feel free to download the source code from GitHub or the Sitecore Package from the Sitecore Marketplace. Click the ‘Edit’ button directly above the name of the field. Don’t see this button? Make sure the files under App_Config and sitecore modules have been published. The raw value is simply a serialization of the HoursOfOperationModel using an XmlSerializer. Here are some examples of what that raw value can look like. Later I will show how to create the HoursOfOperationModel from the raw value and also how to serialize it to the raw value. 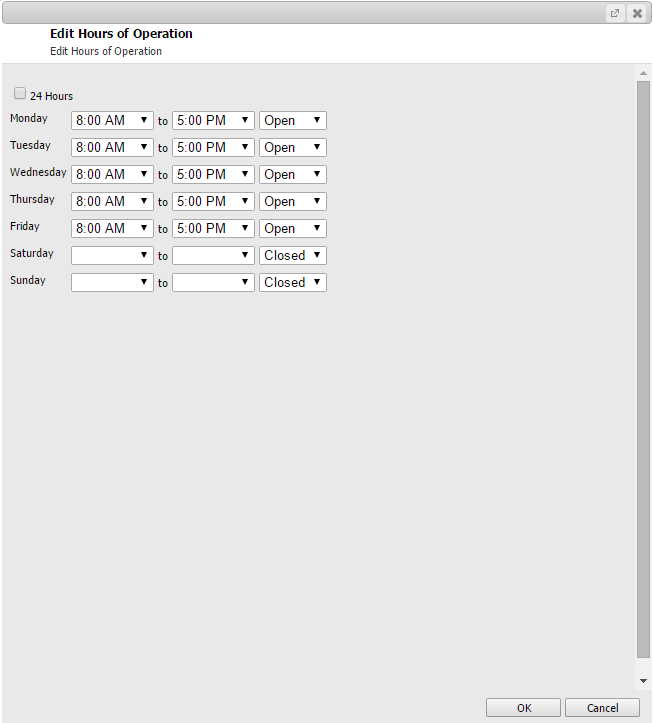 Instantiating the HoursOfOperationModel from the raw value stored in Sitecore is very easy. The model contains a constructor which will accept the raw value from Sitecore and take care of any sanitizing that may need to occur for you. Creating the raw value to save in Sitecore from the HoursOfOperationModel is done by using an XmlSerializer, which does the work for us. See the example method below. We encourage you to download this and give it a try! Want to contribute? Send us a pull request! This entry was posted in Field Types, Sitecore and tagged Custom Type, Field Type, Hours of Operation, Sitecore. Bookmark the permalink.